The Most Wow Gadget of them All. So, I’ve been talking about books a lot, and I’m well into my world challenge. But, I’ll change the pace because I need to talk about something that’s changed my life a little bit. 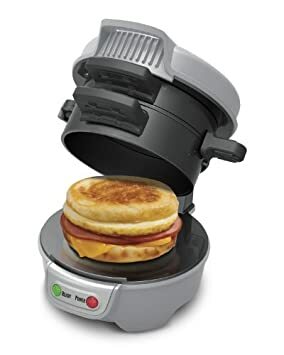 It may seem frivolous, it probably is, but my god, do you have a breakfast sandwich maker? This thing is amazing. It does exactly what it says it does, and it’s saved me a ton of money. I’ve started making one every morning, wrapping it in a paper towel, and wrapping that in tin foil. I have a piping hot, delicious breakfast sandwich when I reach my office. I’ve been doing a whole wheat english muffin, cheddar cheese, a slice of back bacon, and, of course, an egg. It doesn’t take 5 minutes total, as it takes a while to preheat- I run downstairs and by the time I’ve finished my hair, makeup, and changed it’s ready to go. Then you pop everything in, I spend 5 minutes getting my shoes on, getting my bag ready, all that and then bam. Seriously, this is the best $30 I’ve ever spent. If you don’t have one, get one!